Christ Church Cathedral Social Service Society has been operating under different names for something like 100 years, serving members of the Cathedral as well as the city around it. It initiated the ecumenical committee which founded Auberge Madeleine and L’Abri en Ville, which became self-sustaining organizations and which continue to be important elements in Montreal’s network of social services. The Society continues to be an important part of the Cathedral’s life and work, partnering with the Cathedral in seeking ways to address the challenge of homelessness in our community, in caring for the elderly, and in providing the Last Sunday of the Month Lunch. The Social Service Society also raises money for “Christmas baskets” which are distributed to people in need through the various social service agencies in Montreal. The primary fundraiser for this project is the annual book sale, held in the late summer/early fall each year. 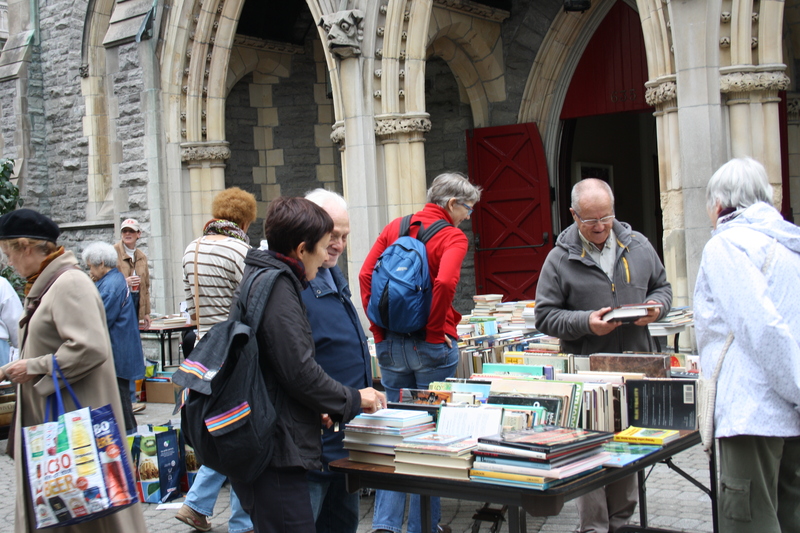 The annual Social Service Society book sale raises money for Christmas baskets to help those in need.